There is a scene in Aberrant that is NEARLY identical to a scene in Divergent, that I had to reread it just to make sure that I had actually read what I had just read! (A few things are switched, but it is basically the same set up). It’s so ridiculously similar that I was literally narrowing my eyes and racking my brain at how stupid it was. (Never mind the fact that the words “divergent” and “aberrant” are almost the same definition). 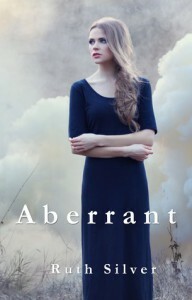 But to compare this book to the likes of Divergent is a mistake, because Aberrant just isn’t as charming. I was actually really excited to read this because it sounded great and I love Dystopian based books. I couldn’t concentrate on the few original ideas flowing through Aberrant, because it is way too similar to The Hunger Games, Matched, or Divergent. Like really, read any one of those. I think you will find many parallels. And besides that, the simplistic writing had me rolling my eyes more than once. So many things were repeated and I was frustrated with it really quick. Joshua and Olivia were very simpleminded. One minute they have no clue about such things as kissing, and the next that’s all they can think about. Seriously, once Josh understands what it’s all about, he is absolutely having it. It made me giggle actually. The most disappointing thing about this book is that they just brush off certain things and never fully explain what the hell is going on!